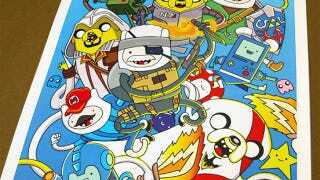 While we've already heard what the creators of Adventure Time would want to see in an Adventure Time game, there's no stopping the rest of us from dreaming. Like this guy, whose dream is one I can get behind. While it's lacking in the kind of originality the series thrives on, the idea of the show's characters playing the part of famous game characters would definitely work. Not in the real world, mind you, as no publisher or platform holder would ever OK this. But me, I'd OK a game where a cute little Game Boy-like machine cosplays as Chun-Li while a shape-shifting dog with Marcus Fenix's voice in a heartbeat.